Make Mother's Day 2018 memorable by giving Mom, Grandma or your wife one of our unique Mother's Day Bracelets! Prices start at $25 - order yours today! Perfect for Mother’s Day, this personalized bracelet features up to 6 silver-plated heart charms engraved with the names of Mom’s loved ones. Each charm houses a small heart-shaped Swarovski crystal birthstone embellished with 24-karat gold plating. For double the beauty, each individual is also represented by a sparkling birthstone roundel charm. While her cherished children are the shining stars of this piece, they are supported by a dangling open-heart charm as well as a “Love” charm to polish off this personal present. For the mother who enjoys a little vintage flair, this handcrafted bracelet features delicate charms that are hand-inscribed with a loved one’s name on the front and their birthdate on the back. At no additional cost, you can embellish charms with a brilliant birthstone. For a classic look with an ode to decades past, the chain is crafted of oxidized mixed silver to produce a clean, matte finish. To polish off this sentimental piece, it includes a freshwater pearl at its clasp for a Mother’s Day gift Mom will adore. This elegant 14-karat, gold-plated bracelet features up to 6 engraved names that are beautifully displayed on polished bars. Each bar is connected with a two-toned heart that encases an Austrian crystal birthstone to represent each child as a piece of their mother’s heart. As a thoughtful gift for Mother’s Day, this chic piece is sure to land a special spot in her jewelry box as well as her heart. This Mother’s Day, you can help Mom show off the family she loves with this personalized bracelet that highlights the jewels in her life. 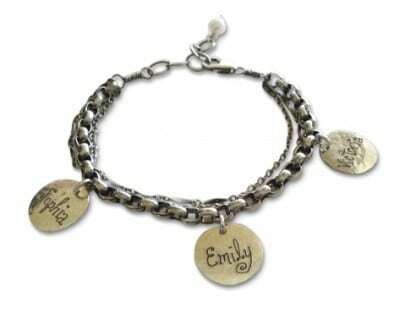 To customize it just for her, you can include up to 6 names, which are engraved onto polished, silver-plated beads. 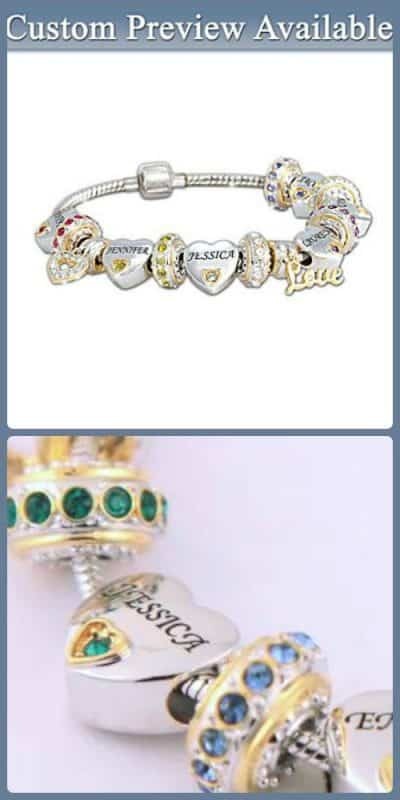 Each unique name is elegantly paired with their respective Swarovski crystal birthstone as well as a shining silver bead and an 18-karat, gold-plated heart bead. Composed of 6 oval discs expertly crafted from hand-polished pewter, this bracelet lets Mom carry her loved ones with her wherever she goes. The simple, modest design of this classic piece spotlights each engraved name as the essential family link that they are. If you don’t have enough names to fill the bracelet, you can complete the design with any date or endearing words for a one-of-a-kind gift. 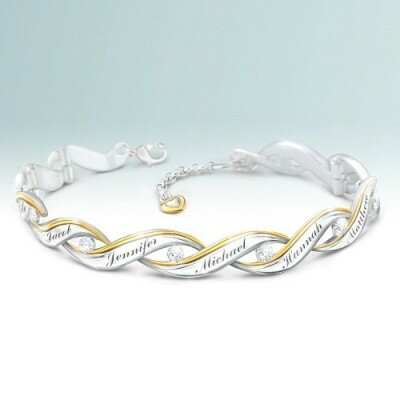 As a stunning testament to the family she loves, this personalized bracelet has room for up to 10 names expertly engraved onto silver-plated links with 24-karat gold accents. Each unique name elegantly weaves into the next to represent a family that is connected by love. To highlight each individual as the jewel that they are, each name is paired with a dazzling genuine diamond. For the perfect fit, it features an adjustable design with a dainty heart charm for a lovely look Mom or Grandma will be proud to wear. What better way to make Mom smile than with the smiling face of someone she loves? This picture-perfect bracelet lets you do just that by featuring her favorite photo within a heart-shaped frame. The image of your choice is photo engraved with the highest resolution available and enveloped in love at the center of an elegant curb chain. Perfect for any lovely lady you want to honor on Mother’s Day, this picturesque piece will be treasured for years to come. Forming a comfortable, stretchy fit, this meaningful bracelet features an alternating pattern of Onyx and silver beads for a stylish look Mom will love. Front and center is a sterling silver infinity charm that serves as a sweet reminder of your family’s forever love. Onto its polished surface, you can choose up to 4 cubic zirconia birthstones to represent her loved ones. Whether she wears a fancy dress or more casual clothing, this bracelet’s versatile design will complement any outfit she wears. For her family full of budding blossoms, Mom provides the love they need to thrive and grow. 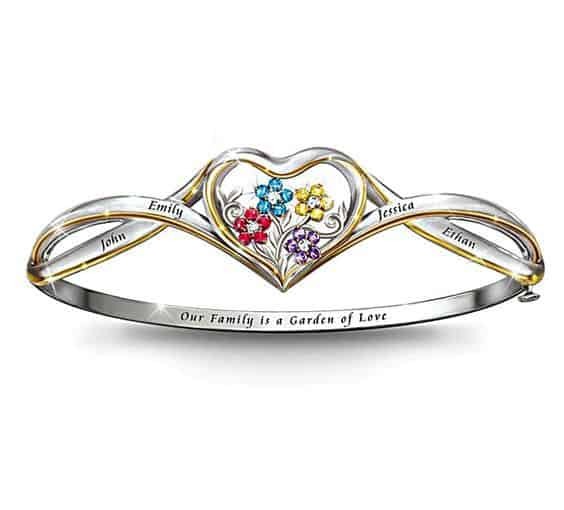 As a nod to her tender care, this custom bracelet is lavishly plated in sterling silver and features an exquisite bouquet of up to 6 birthstone flowers that are set within a centered open heart. Each flourishing flower includes 5 Swarovski crystal-studded petals with a clear crystal in their centers. Richly plated with 18-karat gold accents, the bands are engraved with the names of her tiny treasures for a Mother’s Day gift she’ll cherish forever. Crafted of sterling silver, this personalized bracelet features up to 7 names elegantly engraved onto polished silver bars. 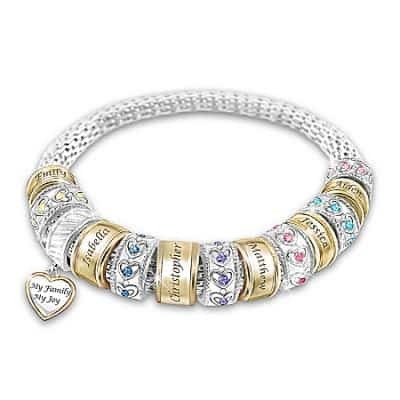 Each name is linked together and represented by an oval-shaped Austrian crystal birthstone. Beautifully faceted to catch the light, these sparkling stones and the individuals they represent are sure to brighten her day. On this Mother’s Day, you can help Mom show off her prized family with this sterling silver-plated bracelet. As part of Mom’s family circle, her children are the brilliant gems that complete it. 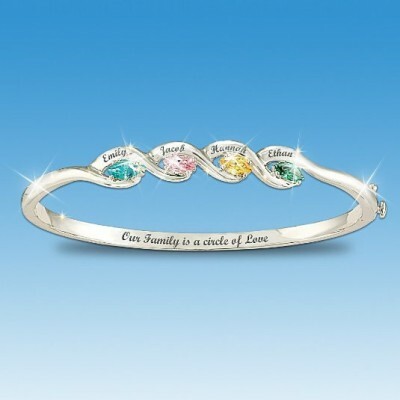 This sentiment is beautifully illustrated with up to 6 cubic zirconia birthstones that are nestled within this bracelet’s wave-like design. Each sparkling stone is topped with an engraved name for a one-of-a-kind piece. For a Mother’s Day gift that shows Mom and baby are an inseparable pair, this simple and stylish bracelet consists of 2 tags. 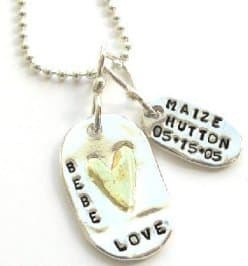 On a sterling silver chain, the dangling tags are crafted with silver made from recycled materials, which follows in the footsteps of Mom’s love that keeps on giving. The adjacent tag is lovingly engraved with a child’s name and birthdate. Perfect for a growing family, you can add more tags as needed. As a Mother’s Day gift that lets Mom show off her pride and joy, this stunning bracelet includes an exquisite blend of 13 beads, which are plated with sterling silver and 18-karat gold. 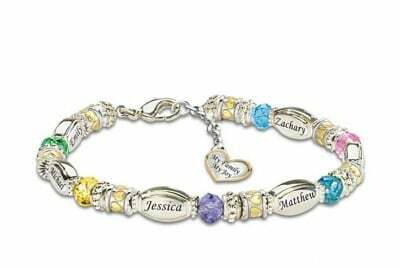 Engraved on the warm, gold-toned beads are up to 6 names of loved ones, while the cool, silver-toned beads provide a sparkling row of Swarovski crystal birthstones set within tiny hearts. For her comfort, it features a stainless steel mesh design for a flexible fit that she can wear all day. 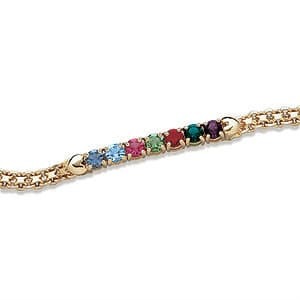 This simple yet striking bracelet features a colorful row of up to 10 brilliant birthstones for a Mother’s Day gift that includes the whole family. The sparkling Austrian crystal stones are hand set onto a graceful Bismarck chain richly plated in 14-karat gold. Equipped with a locking safety clasp, she go about her day assured that this little treasure is safe and secure. 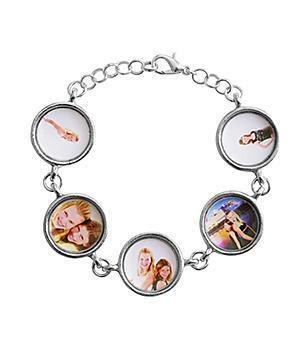 On this Mother’s Day, you can give Mom the gift of yourself with this unique bracelet, which features up to 5 snapshots that gather Mom’s favorite faces into one wearable tribute. Framed by silver-plated pewter discs, the images are protected by a waterproof coating with a glossy finish for a quality look that will last a lifetime. Filled with 5 unforgettable images, this gift will be ready for its close-up when you present it to the lady in your life. 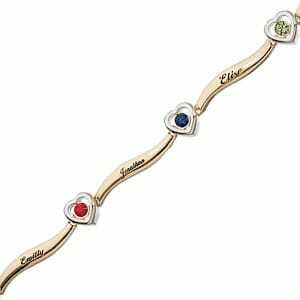 Are you looking for an affordable and unique gift for your mother or grandmother, consider a custom-made bracelet with her loved one’s names or birthstones. You can find Mother's Day bracelets in so many different styles – t’s easy to find one that fits her unique fashion style and personality. 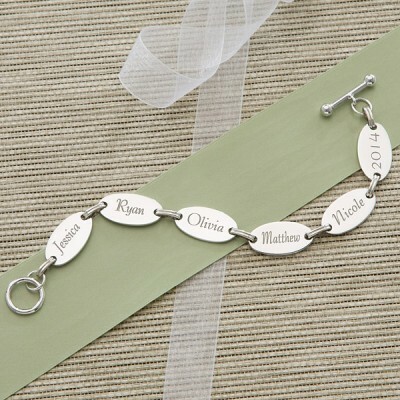 Personalized Mother's Day bracelets come in all price ranges – starting at under $25. 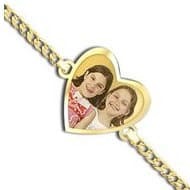 (If you’re looking for an inexpensive family bracelet, your best bet is Limoges Jewelry). When choosing a Mother's Day bracelet, think about the type of metal Mom or Grandma prefers wearing. Most women have a preference for either silver or gold; try to get a bracelet that matches her preference. 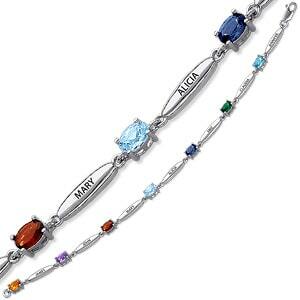 You’ll need to make sure that your bracelet has enough room for the names or birthstones of all her family members. If you have more than about 10 names, you’ll probably need to order more than one bracelet. Your choice is probably going to come down to the overall look of the bracelet. As you’re shopping, try to think of the recipient’s taste in jewelry – simple, or more ornate? Be sure to plan ahead when shopping for a custom-made bracelet. It can take 3 weeks for your bracelet to be custom-made; ordering well in advance of the occasion saves you money on express shipping costs.